Disclaimer: I rec’d a copy of this book as part of the publisher’s blog-review program, Blogging for Books. I rec’d no other compensation and am only required to write an honest review of this work of fiction. The below review is my honest opinion of this work of fiction. First off, let me say I was ready to like this book: Christmas-themed (LOVE Christmas), about the Amish folks (very interested in their way of life), and by Cindy Woodsmall (whose books I’ve enjoyed in the past). So I was really ready to like The Christmas Singing: A Romance from the Heart of Amish Country. I didn’t just like it though, I love it! Woodsmall has a way of taking the Amish culture and shifting our stereotypes of that culture. I still often think of the Amish as the wagon driving, all in black, almost stuck in the 19th century. But Woodsmall, who obviously has much affection for the Amish and their ways of life, modernizes their story a bit from this stereotype. In this particular novel, she has the main character, a 21-year-old baker named Mattie Eash, living away from her parents (though, with her brother) running a very successful bakery for Amish and Englischer alike. Somehow, I never think about the Amish women as being “career women” — my ignorance! Mattie is an artist when it comes to baking celebration cakes (and Woodsmall includes a couple of recipes in the back of the book in case Mattie’s have whetted your appetite). But, Mattie is also a tad forgetful and scatty. Due to her scattiness, she must leave Ohio and her business and come back home to recuperate. Only problem: her former beau, Gideon Beiler, is in the same town of Apple Ridge, PA. Three years earlier, Gideon seemingly dumped Mattie (after they’d been courting all their lives) for an Englischer … that’s why Mattie is in Ohio and Gideon is in Pennsylvania. The story continues to unfold as time goes from Thanksgiving toward Christmas Eve … a joyous season of the year made more wonderful with Woodsmall’s story. All the characters are so delightfully drawn — from Mattie’s Mamm and Daed to her cousin and aunt (both of whom get married in the midst of the Advent season) to Gideon’s Englischer and even the folks who drive the Old Order Amish around. This is not high literature; it’s a fun read on a rainy afternoon in the Christian chick-lit genre. But it will make your heart sing and wish you had Mattie and her “Mattie Cakes” in your own town. 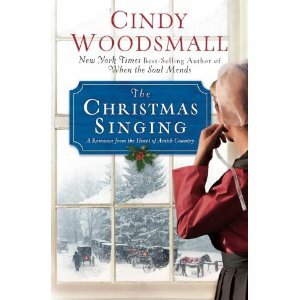 The Christmas Singing: A Romance from the Heart of Amish Country is a wonderful read.